ASP.NET Core is a cross-platform open-source framework. It enables development teams to create high performance and scalable web applications. The ASP.NET Core 2.2 new features bring together the best-of-the-best elements of the old .NET framework. It comprises of the latest versions of .NET MVC, Web API, Web Pages, and SignalR, and allows you to use them independently in the same application. 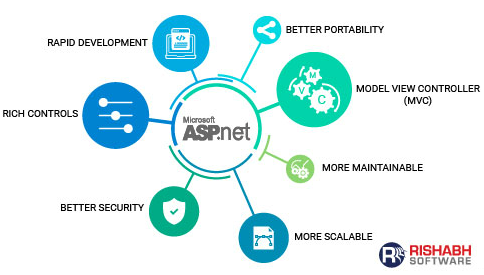 That is why ASP.NET Core is seen as a next-generation development platform and as the most successful framework of Microsoft. With this article, we have highlighted ASP.NET Core new features to help you find solutions to the challenges in your apps and enhance performance. When targeting Mac OS, Linux or Unix systems, the .NET Core stands out as the best choice. Developers can now deploy the latest technologies like Docker, Microsoft Azure, Kubernetes and others with ASP.Net Core. The .NET Core SDK offers many command-line tools that help create, compile, build, and publish a .NET Core application on any OS. ASP.NET Core surpasses the classic ASP.NET by a factor of 10. The Microsoft team ensures that it performs better than current technologies used in microservices (Node.js, Go, and Java servlet). Serialization, compression, networking, concurrency, which are contemporary in the age of Web APIs work much faster with .Net Core. The size of an HTTP request went from 30 kb in ASP.NET to 2 kb in ASP.NET Core. It greatly improves performance. The benchmarks have indicated that an ASP.Net Core application can handle 1.15 million requests / second, which is 2300% more than ASP.NET 4.6. The MVC and Web API development models are unified and use the same base class Controller. It allows a controller to expose HTML (View) and Web Service features. The MVC model of ASP.NET Core provides functionality for creating web APIs and web applications that are testable. Further, built-in support for multiple data formats and content negotiation allows your web APIs applicable across a wide range of platforms, including browsers and mobile devices. The ASP.NET Core 2 new features consist of a set of libraries defining an abstraction and an IHealthCheck service, as well as a middleware. The BeatPulse project, initiated to fill a gap in the ASP.NET Core ecosystem when no library of health checks applications was available, now, supports the new Health Checks API implemented by Microsoft. For developers, this means they can easily add health checks for dozens of systems and dependencies by using them. Dependency injection has always been at the heart of development issues since it allows for weak coupling and better code testability. The framework now combines a whole new architecture related to the dependency injection. The modularity and flexibility of ASP.NET Core rely heavily on dependency injection, which is now one of the essential features of ASP.NET Core. Since ASP.NET implements the management of the injection of dependencies natively, developers will no longer need third-party tools to achieve this practice. Another ASP.NET Core latest feature includes the addition of a Java client for SignalR. It is a library for ASP.NET that allows server code to send asynchronous notifications to client-side web applications. As for the Java client that is added, as it supports connection to the SignalR Server from Java code, including Android apps. ASP.NET Core applications no longer require IIS for hosting. They can now be self-hosted or hosted on Nginx for Linux distributions. It comes from the desire to launch a .NET Core application independently on all platforms. Even in production, IIS (or Nginx) is a reverse proxy for the self-hosted application. ASP.NET Core implements many common APIs with the .NET Framework in addition to APIs that are specific to Unix, Linux and OS X. Common APIs are grouped in .NET Standard, which is implemented by both .NET Core and .NET Framework. It means that any code that targets .NET Standard can run on .NET Core and .NET Framework which makes it simple enough to share code between the two platforms. 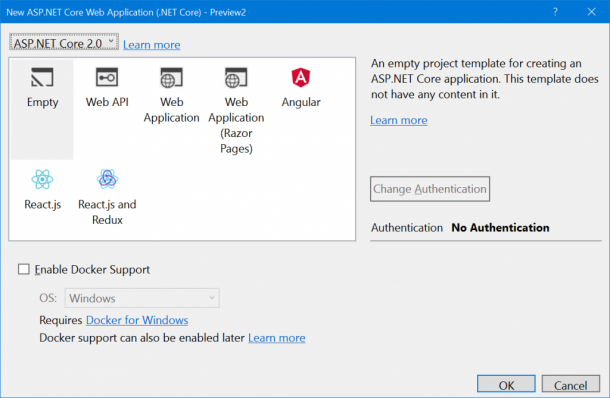 Another novel ASP.NET Core 2.0 new features are the appearance of Razor Pages. This feature gets enabled in the Startup class via dependency injection. These new pages allow the implementation of independent views of controllers and make the development of scenarios more fluid page while clarifying the architecture of your solution. Swagger has become the most popular technology for designing and describing RESTful APIs. Its use allows developers to document and develop APIs while maintaining synchronization with the code. The compilation is powerful with ASP.NET Core performed within memory. Therefore as soon as the code changes get saved a simple refresh of the browser allows its activation. Create web applications and services, IoT applications and mobile back-ends. Deploy in the cloud or locally. 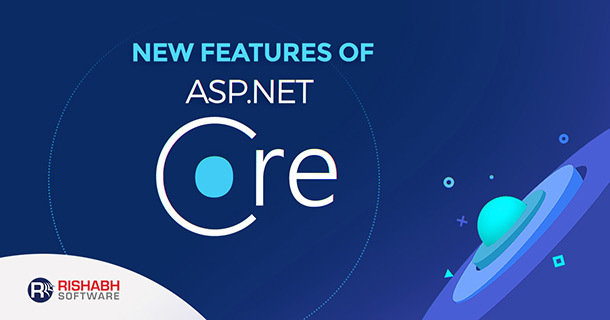 ASP.NET Core is a high-performance, open-source multiplatform framework for creating modern cloud applications that are connected to the Internet. Before embarking on the development of an application with ASP.NET Core, it is recommended to validate that the new framework covers your needs regarding APIs. As an ASP.NET web development company, our certified developers will provide custom solutions to match all your business requirements.